Discussion in 'Fishing' started by Curly Shuffle, Apr 21, 2015. Nobody has posted a fish picture in a while and since I have not been able to hog hunt lately thought I would post a picture of my last trip with the daughter. Thinking it is from January of 14 at the jettys in Galveston. Took all I had to get out there with the daughter (Miss Piggy) but we caught fish and it is always fun to watch her because she loves to fish so much and goes every chance she can. I am glad we have some friends with boats and they take her fishing when everybody can get together and figure out when to go. FISH FISH!!! lonepunman, gshock, Jake and 6 others like this. Nice Redfish! I have yet to go catch one of those. Hopefully soon. Arnold Galvan, Galveston340, rob072770 and 3 others like this. That's a nice one. A good thing down here we have them all year long at one place or another, in the bay/s or at the jettys and our Bull run is in the early Fall for a few weeks. You run charters?? I did that and hit the offshore tournaments for years and years and brought back a couple big boats from Cape May and Pennsylvania down the coast and around to Texas and all points in between. Much younger back in those days when I could take a pounding for days at a time !!! Good fishin to ya Cap!! FISH FISH!! The daughter in Venice with a Black Fin Tuna. Capt. 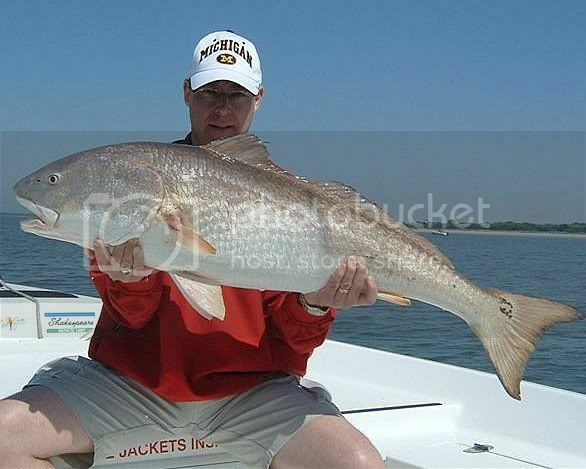 That is one nice red Drum to big to,call a puppy drum. When I lived on the Outer Banks and fished Oregon inlet to Hatteras inlet. Was a big time had a very nice Hydrosport. Boat was way worse of wallet the BGD. With a 100 gal gas tank but used to get off work and go fishing most days. Fresh fish all the time. Was younger them and could take the pounding going to,the drop off. ...some good looking Reds there Ya'll! I'll be hitting them again pretty soon. Have to pick up a new sticker for my 22 Skeeter and get her cleaned up then it's on. Usually fish West Bay down here as well as the Bayous around here. Galveston Jetties are usually good to catch some big ones by the Boat Cut on the North Jetty, but I find that the fat girls you want to enter in a tourney that are still legal are in the bayous. That is a slob wow. The bait finally showed up down south last week. The Okeechobee flooding of the Gulf has really hurt the south bays no bait no fish had to run to Gulf. Last weekend the Snook and Red bite was insane, 2 throws of the net and had 500 shiners and was chumming all day can't wait for this weekend! Your picture would be all aces.....except for that hat....use it for a chum bat! Headed down to Florida last year chasing schools of bull reds caught some big boys and a few jacks mixed in. Drop Zone, Chopperdrvr and Curly Shuffle like this. Was that in the fall? It's amazing when those big spawners get into a bait ball they get so wound up you can throw anything at them. One trip after about 2 hours of hammering a school I put a piece of salami on a 2/0 and instantly hooked up. Then my buddy put a wet piece of tissue paper on and wham! From the looks of it I see barrier islands....gulf coast? Was that in the fall? It's amazing when those big spawners get into a bait ball they get so wound up you can throw anything at them. I put a piece of turkey on a 2/0 and instantly hooked up one day last year. Then my buddy put a wet piece of tissue paper on and wham! From the looks of it I see barrier islands....gulf coast? Yes that was in the fall in a little back bay in Florida, couldn't tell you where I have no idea but what I can say is that was some intense fishing we had plenty of pogies but we mixed it up and threw everything but pogies, I caught multiple big boys on a two inch rebel popper using light tackle. It was a great time. That's the way to go lightest tackle possible. When you get them out away from the mangroves in big schools you can let them run like stallions just a hoot a great way to wear yourself out! If you ever come near San Antonio there are a few lakes with reds in them one being braunig lake, casting gold spoons to working birds you can catch your fair share of bulls they go through the same spawning runs but are sterile here is what you can expect to catch. Drop Zone, 437, Chopperdrvr and 3 others like this. whew those are some stout bull reds! nathan koepp, Chopperdrvr and Curly Shuffle like this. Very nice I bet money that fish has broke off many an unprepared angler.